Dental implants are replacement teeth that look and feel just like your own, unlike false teeth such as a bridge or partial denture! When a tooth is lost, it’s best to consider implant replacement as promptly as possible in order to minimize negative effects of tooth loss, which include reduced chewing ability, bone loss, and shifting teeth. After tooth loss, the load on each remaining tooth is increased because there are fewer of them. To restore proper chewing ability, the support lost from the missing tooth needs to be replaced. Dental implants are designed to provide a foundation for replacement teeth that look, feel, and function like natural teeth. The person who has lost teeth regains the ability to eat virtually anything and can smile with confidence, knowing that the teeth appear natural and that facial contours are preserved. The implants themselves are small biocompatible titanium “roots” that are placed into the area where teeth are missing. The bone bonds with the titanium, creating a strong foundation for artificial teeth. In addition, implants can help preserve facial structure, preventing the bone deterioration and facial collapse which occurs when teeth are missing. When teeth are lost, the jawbone degenerates. Nature follows a “use it or lose it” phenomenon! Where implants have been properly placed and maintained, the bone tends to be preserved since it is still being used. Dental implants are changing the way people live! With them, people are rediscovering the comfort and confidence to eat, speak, laugh, and enjoy life. Dr. Setter has extensive training and experience in Dental Implant Surgery, including completion of the Misch International Implant Institute and attaining Fellowship status in the International Congress of Oral Implantology. He includes the most up-to-date technology and techniques in all of his treatment so that your treatment achieves outstanding results using minimally-invasive procedures. If, like many others, you feel implant dentistry is the choice for you, we ask that you undergo an implant consultation which includes a health history, dental history and clinical/films evaluation. We will review and explain your existing conditions as well as risks of delaying or not having treatment at all. Depending on your specific situation and the type of implant chosen, Dr. Setter will help create a treatment plan tailored to meet your needs. Your questions and concerns are important to us and our team will work with you very closely to help make your procedure a success. 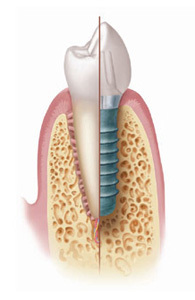 Dental implants act as tooth root replacements which are placed into the jawbone. Some patients may have been told in the past that they don't have enough bone for successful dental implants. Dr. Setter uses the most current technology and procedures such as sinus grafting and ridge augmentation which can help correct this problem by naturally and predictably replacing lost bone and gums. Because of the protocol we use, most patients surprisingly report little to no discomfort during and after the procedure. For most patients, dental implants can be placed in just one visit. In the first step, implants are placed within your jawbone under local anesthesia, the same feeling as when you get a filling or crown. Most patients have very little discomfort following the procedure, many stating it’s as easy as (or easier than) getting a filling. For the first three to twelve weeks following this step, the implants are gradually bonding with the jawbone. You should be able to function normally with some type of temporary replacement during this time. After the implant has bonded to the jawbone, the second phase begins. At this time, your restorative dentist designs the final tooth replacement, which will ultimately improve both function and esthetics. An impression (mold) must be taken to match the replacement tooth to your existing dentition. Then, a small connector can be placed to anchor the new tooth (crown) to the implant. The entire procedure usually takes two to four months and most patients do not experience any disruption in their daily lives. Dental implants can replace a single tooth, several teeth, or an entire bite. They can also be used to anchor dentures and partials to improve their fit, stability, and function. Implants are designed to be long-term tooth replacements, lasting longer and more predictably than other tooth replacement options.